I am amazed as I sit down to write about our time in Hatchet Bay… that we were there for ten days. Ten. Days. TEN DAYS of our lives that are already remembered as a pleasant Blur. 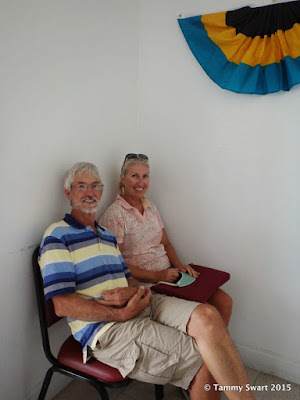 Once we realized that the back-to-back weather systems rolling across the Bahamas would be making things unpleasant, we quickly decided that there really was no option other than to just settle in and wait it out. Yes, we COULD leave, but we would be subjecting ourselves to uncertainty that would most decidedly tip the scales towards unpleasantness… and we aren’t much up for that. It’s funny. I have to go back through the pictures we took in order to even remember what we did for all of those days. Let’s just go through them together. Perhaps you remember our hasty departure from Rock Sound almost two weeks ago… Well, we left there without topping off our water tanks. The weather turned ugly so we just left at about half full tank capacity. This makes me nervous. The last thing I want to do is get trapped on the boat for days by the weather and run out of water. So the first order of business in Hatchet Bay was to source RO water. The water plant. Nice people, delicious water! There are supposedly numerous public water spigots throughout the settlement, but we went straight to the water plant for drinking water. We docked around the corner from the government dock and walked across the street with our empty 5 gallon jugs and our new (to us) wheeled cart. The lady at the Lutra Pure store was very nice and we chatted while the jugs were filled and Bruce carried them one by one back to the dinghy. She and I became pretty cozy before we left the Bay. She’s a nice lady and she shared lots of info about how it is to live and own a business in the Bahamas, especially the new VAT tax that’s been implemented. Anyway, we took our 25 gallons of water back to the boat and decided to check out the public spigots to see how good (or bad) the water was before we made another trip to the plant. We had paid $4.30 per five gallon jug. While that isn’t a lot for drinking water… I’m not going to feel free with it for washing my hair and doing dishes. We took a short walk around town finding two public spigots. One was locked and one was open. We ran a cupful intending to test it but it came out brownish gray and very murky… no need to test that. Guess we’ll be buying more water. But… rain was in the forecast so chances were good that we would be able to collect free water from the sky! On our rainy days, which were maybe 5 in all… collecting rainwater was about all we did. We would stay inside the enclosure, or if it got too bad and the enclosure got wet, we huddled down below. We mostly read. I cooked. We ran the generator twice a day to charge our batteries on those days since our solars were getting a little vacation. Every time we ran the generator we would heat water for bathing, charge up our electronic devices… and run the air conditioners! YES! We would dry out our boat with a little blast of cool dry air. The rain would last all day. Mostly it was light and steady, but there were several periods of torrential downpour. At first, we let the water run off the boat. We had arrived with a thick layer of salt from the big waves outside our safe haven. Once we felt that the rain should be running relatively clean, we started collecting it in our five gallon buckets. We tested the quality and found it to be a wonderful 76ppm. That is better than what we’ve been buying!!! We filled our back tank but had to wait a couple of days for another big rain to top them all off. The second time we collected about 84 gallons of rainwater that measured in the 60’s. We wished we had more buckets!!! Alice Town was a sleepy little place. On sunny days (or maybe just not rainy days) we walked the streets. As usual, the people are so very friendly. The homes are modest buy the people seem to be happy. Look who came in out of the rain! The Liberty Clipper! We saw several locals taking food from one particularly unassuming little building. Bruce zeroed right in on that place. His theory is that if the locals are eating there, it must be good. We talked to the owner and decided to return for lunch the next day. Bahamian menus require some interpretation. Today’s menu consisted of sweet and sour pork chop… baked chicken… and curry chicken with rice. We chose the latter… but in retrospect we should have known that the first two items had definite recognizable pieces of meat. Therefore, by process of elimination, the chicken curry with rice would be the parts of the chicken that didn’t make it onto the baked chicken plate. It was GOOD… but again, we’re going with “authentic”. Had to go to the liquor store next door for our drinks... even water! After our lunch out, we joined Deb and Paul from S/V Kelley Nicole at Da Spot. It’s a funky little locals bar near the dock. We whiled away the whole afternoon, enjoying cheap beer and really good rum punches while the locals carried on with life as usual around us. The grocery store in Alice Town was pretty nice. They had a decent selection… nothing like Georgetown but better than the other outer settlements we’ve visited. The prices were even pretty good. We have finally run out of chips from our original provisioning back in the States. We were able to find a couple of bags of chips at prices we would pay. We picked up a few things and paid while the lady working there jiggled to the beat of a Christian music radio station. She even showed us pictures on her cell phone of the flooding on nearby Harbour Island. Crazy… I wondered why the water didn’t just run off into the ocean… Guess there are some low spots. We asked her if there was a place to buy fresh bread and were given directions: "Go back one street and turn right. Go down until you pass the peach colored house on the right and the yellow car on the left, then take the next track road to the left." We cautiously followed the instructions and found this house with no sign. We halooo’d and a guy told us this was the right spot. A lady came out looking at us as if she wondered how we had found her… but then she sold us some really great bread for $3.50 per loaf. We should have bought more. We dinghied back as the rain began to fall! We met up with another couple from S/V Cheshire and went exploring. There is a huge cave about 2.5 miles north of Alice Town. We figured we could walk that so off we went. It wasn’t long before we got picked up and Bruce and I had our first Bahamian hitch hiking. I was very glad that we didn’t have to walk all that way. It was a sunny day but strangely cool after the rains. Still, it was a long distance. The lady dropped us off at the entrance to the caves, where there used to be a sign… but it’s gone. Without her we might have missed it. Hatchet Bay Cave is huge and extensive. There are three levels. We followed the well worn path down into the first level. I was once again amazed that this place is just open to the public. Unfortunately, that public has been unable to control themselves as is evidenced by rampant graffiti. It is very sad. There are supposedly some sort of writings on the walls that were not done by recent visitors and while I think I might have spotted one of those, I’m not sure. Look closely... I caught a DRIP! Lori and Mike went down first! There is evidence of water having once been down here. Many of the formations are water carved. 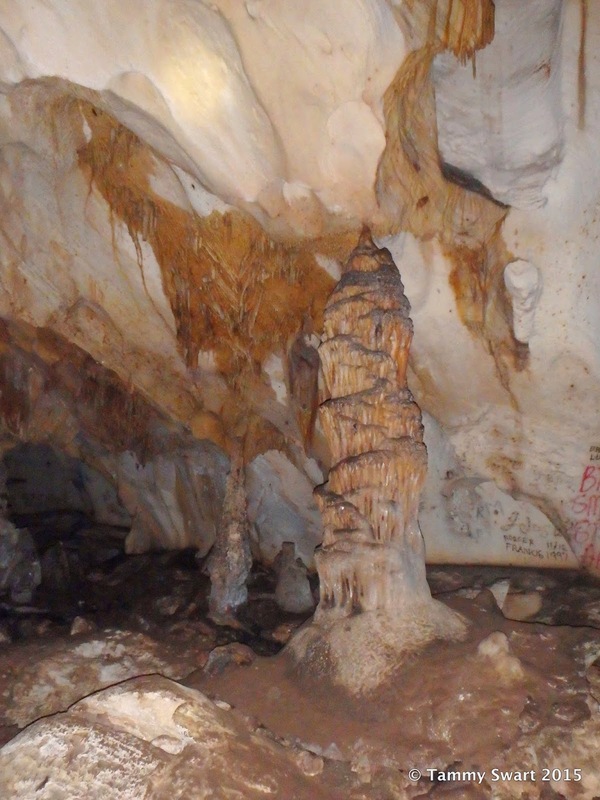 Others are the typical stalactite and stalactites but there were really not so many of those. The ladder down to the third level. I was just beginning to worry about making it out alive when we happened upon the ladder leading to the third level of the cave. It was a wood ladder that led down into a small hole where water could be seen waiting… That portion of the cave was over our experience level and should be visited with a guide or by experienced cave divers… not us. Just after that we saw a light at the end of the tunnel, literally. One last skinny spot to crawl under left us staring up from the bottom of a deep hole. It was like being down inside of a well. The walls were sheer vertical rock. Our only way out was to scale a rope ladder. My initial knee jerk reaction was: No way I’m getting up that!!! But the only choices were that or retraced our steps back through the cave. Guess we’re going up. Ever wondered what it looks like from the bottom of a WELL???? It was not as difficult as it looked. Only the last part was dicey as I gripped the bottom of a bush growing in the rock at the top. I thought for a second that it was very possible that today would be the day when that bush decided to uproot… but it didn’t happen. WOW! What an experience that was! We followed the trail through the bush back to the cave’s start and made our way back to the road. Since they went first last time, we went first this time! 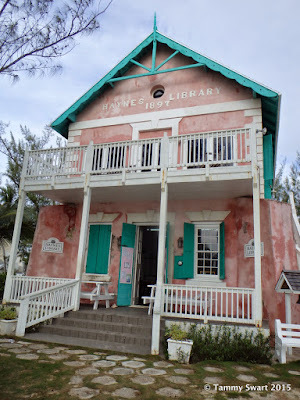 We hiked further north up to take a look at Gregory Town. We stopped at the Sugar Apple and paid way too much for fish/lobster tacos then hitched a ride back to Hatchet Bay. After several cars passed us walking, Bruce held out a five dollar bill and the next car stopped. It was a fun and adventurous day. One of those that left me wondering how I ever ended up here… doing this… while life goes on as usual back home. Our three month anniversary is fast approaching. It’s hard to imagine we’ve already been here for three months. Time to renew our immigration status has arrived and we need to find an immigration office pronto. 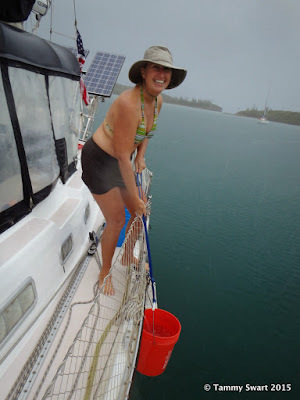 Since S/V Kelley Nicole were with us on our crossing from Miami to Bimini, it was time for them too! We picked what we hoped would be a sunny day (not) to rent a car and take an island tour of Eleuthera. Turned out that we had some rain, lots of clouds, but a nice cool day to explore. But first, we needed to get our immigration office visit out of the way. We drove to the North Eleuthera Airport, such as it was… and were told that we needed to go to another office back in the town. This was not an unexpected development… I’ve heard the stories. After a side trip to Jimmy’s liquor store (where we found super cheap prices and piled our trunk high with boxes) we backtracked to the little town. We found the office. It was closed. No phone number, no hours of operation on the door. Hmmm. We walked next door to check out the grocery store while Bruce waited at the door in case someone showed up. I never miss an opportunity to shop for groceries. You never know what you’ll find. Then, back to the airport we went to report our findings to the immigration office. The guy there called for us and told us to go back again, she would be there in ten minutes. Back we went, she showed up, we filled out our forms requesting an extension. Nothing too difficult, where are we staying, how will we support ourselves while here… The usual. After a short wait, we had our extensions and the rest of the day to enjoy! We drove back south on the Queen’s Highway and stopped at the Glass Window. It isn’t as impressive in settled weather as it was the last time we were here. We took a charter on the Liberty Clipper back in 2011 and the Atlantic side was a wild frenzy of towering, crashing waves. Today, the dark clouds provided a dramatic view… and a downpour that cut our visit short. Next stop, Governor’s Harbour. We stopped at the French Leave Resort so that we could pay for that night on their mooring ball a few days ago. The manager was so impressed with our honesty that he waived the fee. Nice guy. The facility is very new and still under construction. But what is there is just stunning and very upscale. We had lunch in their beautiful restaurant. It was delicious and not too expensive. Leaving there, we headed to the other side of the island to see the pink beach and hopefully, to find that funky beach bar we hung out in back in 2011. Finding it from a car was different than walking up on it from the beach side, but when we passed The Beach House, I just knew that was it. We spent an enjoyable afternoon talking to the two bartenders there and learning about their lives. I love it when you get the Bahamians talking about their home. Yes we closed down the bar with these two! Well, that’s it. After we had our renewed visas, the weather forecast looked like we would get a break. Several days of light winds. Not from the right direction of course, but light enough to allow us to make our two-day jump to the Abacos. Hatchet Bay was a perfect place to hide out from weather. But we’re happy to be on our way again! Wonderful write up as usual...great pictures. And also as usual, thanks for reading our stuff and being such a constant friend Richard. Great post and awesome pics. I have to say, you'd never get me in that cave! Thanks! Oh come on... you guys are now intrepid Cruisers! You may be surprised at what you will do now that your comfort zone will be ever expanding!